Testimonies ............ A selection of positive responses !! dann mußte ich leider aufhören. Aufdringliches, ein bisher unerreichter Grad an Natürlichkeit. größeren Mundorfs und noch mehr Kapazität, oder gibt es da eine "natürliche"
Detailreichtum, noch mehr Natürlichkeit, und vor allem noch mehr Dynamik. I have a modified Marantz CD-67SE CD player ,re-clocked with upgraded opamps, upgraded caps, defeated muting circuit, and with RFI filtering. The DDDAC1542mk2 sounds near identical in clarity and sound stage. I can't wait to add a master and slave DAC modules and advance my listening pleasure to next level. Again, thanks for sharing your remarkable DDDAC design available at such a reasonable cost. Just finished to mount, now i'm doing a listening session to compare to crystal clock. At the moment i can say that sound imagine seems more focused and instruments are more separated. Soundstage increased a lot, a modify that i suggest to everyone !!! In addition i feel less listening fatigue then before. Now the combination of PC source, USB DAC with reclocking, fullrange speaker and gainclone amplifier is perfect (before was a little too metallic, for my taste). van de prachtige weergave van de DAC. Eindelijk een cd weergave waarnaar het prettig luisteren is! eens laten horen hoe goed een nos-dac kan klinken! I finally finished the 11V power supply for the DDDAC. It works great, and is dead quiet. Het pakketje is binnen, bedankt en gad it weekend hem in elkaar zetten. en detailrijk met voldoende druk. De stemmen zijn mooi strak en helder zonder scherpe klanken en slisserig. goede plek waarin veel rust aanwezig is. tesamen met een puk van ebbenhout. behuzing na, maar dat komt wel goed. Just letting you know that I received the kit 2 days ago and have the USB module and 1 of the towers together. VERY satisfied. My Cavalli-Futterman is really singing now! tomorrow and will try them for output. Can´t wait to finish the burn in. die bestellung ist im anhang. Na het opnieuw opbouwen van de toren voldeed deze en kon worden ingezet. accu gevoedt zou moeten worden trek je mi. de accu keer op keer "ruw"
choke-input is in deze voeding cruciaal...(zie schema). karakter te verliezen... En dit allemaal met standaard "niet audiofiele"
TDA1543 parallel nog beter zijn? Doede, een fantastisch ontwerp! Ik geniet er elke dag weer van! add to the my DAC. Result is fantastic. I did not expect such difference. more power in loudspeakers due obviously garbage is cleaned from sound. and finish the story there. Thanks and Marry Chrismas again. I just wanted to thank you for creating such a great opportunity for us, silly diy freaks!!! giving the sensation of greather dynamic range. Voices are played like in heaven, making this DAC to sound more HUMAN than expected from a digital device ! Listening at very lower levels in the midhight was an elevated pleasure. I just used as output caps two Mundorfs pio 0.47 uF, and as IV resistors Dale 1% precision 5watt. this with the 2 M4X60 screws plus thermal compound between chips, tower pieces and the big sink. The sink is getting 47 C deg after 2 hours at 20 C deg ambient. Because of using a little woodden box, I was cuttinng the heatsink of Lm317- on the twer pcb - a bit, adding instead some extra small copper sinks to compensate for the surface loss. supply you feed a profi digital camera when working indoor, to save your batteries - not a cheap one I guess, but I will measure it soon. Results are amazing; I hear no significant difference between the switching PS and battery!!! You've given me the upgrade of the century!! I've read about this kind of enlightenment when reviewers drop this bit or that bit of new kit into their systems. Black background ... timing sounds right now instead of having to make yourself believe its ok, and hearing detail now that never existed before. I'm so happy with it I've just ripped out my Arcam DV27 and I'm going to sell it. No point in keeping it now. What can I say other than it sounds greate! Voor enige tijd terug usb-I2S print bij je besteld en ingebouwd/aangesloten op de I2S bus van mijn zelfbouw TDA1541 DAC. Deze is voorzien van step-up tafootjes en een mu-stag buizentrapje ingebouwd in een Philips CD speler. Doordat de I2S bus ingang van de 1541 nu omschakelbaar is tussen usb ingang of de af te spelen CD, is vergelijken tussen een CD en harde schijf erg goed mogelijk. Het DAC circuit blijft tenslotte hetzelfde. Gewoon tegelijk de CD en de hardeschijf bestand starten en eenvoudig omchakelen. En ik kan niet anders zeggen dan, tsjonge, wat klinkt afspelen van schijf toch verschrikkelijk mooi. Bij de ene opname is het beter hoorbaar dan de andere maar vooral de natuurlijkheid en ruimtelijkheid zijn beter dan vanaf CD. Een ding is zeker, de CD speler heeft zijn langste tijd gehad. Bedankt voor dit moois! I just wanted to write and thank you for the DDDAC kit. I finished it yesterday. It was a very nice project to build. The aluminium pieces for the dac tower, in particular, made it much easier to build than I had expected. I am running it from a TREAD psu (Tangent) but may build a better supply before I put it all into a box. At the moment, the output capacitors are the ones you supplied, the Rload resistors have not been optimised for 3.85V yet and everything is just fixed to an open wooden board. Despite this, the sound is very good and is what I had hoped for when I started reading about NOS dacs. Probably the best way to describe it is that I find myself just listening to and enjoying the music rather than thinking so much about the equipment. I recently finished a pair of two way active speakers (Siegfried Linkwitz’s Pluto design) and although I liked the sound very much, I felt there was something missing. I thought the cd player (NAD C542) was the weak link and your dac seems to have remedied that. I am going to upgrade the output capacitors. Could you clarify for me – do I need to replace the 100nF film and the 100uF electrolytic capacitor with just a 470nF Mundorf or is an electrolytic needed as well? I will order the usb kit sometime soon – I like the idea of a computer-based sound system. I have build a standalone audio player with your DDAC1543MK2. erst mal ein großes Dankeschön und Lob für deine Web-Seite. Bauvorschlag in einem USB-Gehäuse aufgebaut (siehe Fotos). PCM2707 die Buffer bei 8 DAC's schon braucht. Wenn ich direkt betreibe, klingt es irgendwie nicht so "voll und dynamisch". Und nun kommt schon gleich die erste Frage? Übertrager, die auch problemlos beschaffbar sind. SR702 AV-Receiver optisch zugespielt ist er ganz klar überlegen. Was soll ich sagen, man ist einfach näher dran !!!! Just thought I'd let you know that I've completed the build and everything worked first time. Very straightforward, even for me, who hasn't populated a circuit board in a very long time. Good to know I've not completely forgotten how to do it..
Well, what can I say? It's been on for about half an hour playing music so far. I have it wired up to a 12V battery and I've just played a selection of tracks through Foobar after it recognised the USB DAC straight away. I am between houses at the moment and living in a flat, hence my turntable and all of my vinyl are in storage for the next 6 months, which was my reason for this project in the first place. Strangely, the AC97 sound from my shuttle PC sounded very good through my Musical Fidelity A3.2 Pre-Power amp combination and Mission M71i speakers (a bit of a mish-mash of equipment I know), there is some very strange synergy between the components as the combination already sounded better than most digial audio I have heard. I was going to do an A-B comparison of the new DAC with the AC97 output, but within 2 songs it was clear that this was a waste of time as the differences were completely obvious. Much wider sound stage, better dynamics, really clean sounding. Instrument timbre like I'd never heard from a computer before, depth, involvement, detail.. All improved massively. I'm a compulsive song swapper, never playing anything to completion, especially when I have new kit to listen to, but not here. Every single song I have heard so far has demanded my undivided attention and made me sit all the way through, such is the level of involvement. It's truly breathtaking and I have to admit that it's way beyond anything I was expecting, especially considering that this is the DAC in its most basic form with no tweaks. I am astounded and extremely excited at the prospect of spending the rest of my weekend listening to MUSIC! It also has that quality that makes you want to play everything loud ;-) as there's just no fatigue inducing sounds in there. WOW! That's all I can say! And it's not even 'burned in' yet. I guess that the initial enthusiasm will subside in the coming weeks and I'll start to find faults here and there, but the beauty of that is that when I do.. I just order the next stage of the DAC from you.. I'm so happy! Thank you once again Doede, you have turned someone who has spent the last 15 years being very cynical towards digital audio into a total convert. I have to get back to my music now.. I hear it calling. My system centers on Maggie 1.6s. I’ve been doing a lot of upgrading and exploring over the past 6 months, often hearing signs really nice sound, but it was not until I replaced my Bel Canto DAC-2 with the 24 chip DDDAC1543 MK2 that my system really opened up – as if my system had all kinds of potential that was being held back at the very source. The improvement in imaging was huge! Vocals and instruments took on a special kind of leanness where they became well defined, with each note occupying its own space, but without sounding lean or edgy. There was also something present in my other DACs (which also included the Benchmark), that was annoying the heck out of me and was especially noticeable in vocals. I’m still not sure what was causing this annoyance, be it RFI, smearing due to digital filters, IM distortion, or one of the many other possible causes, but I’m happy to say this annoyance disappeared immediately after installing the DDDAC1543! A lot of exciting stuff has been happening to computer based audio in the past few years, but the USB interface has had its share of limitations. For example, I notice a lot of “pseudo” USB DACs on the market that lack necessary advances like the I2S interface. Not so with the USB version of the DDDAC1543, which contains the latest and greatest advances and truly unleashes the many advantages my computer based audio has to offer. Many thanks to Doede Douma for taking the time to produce a truly advanced DAC and providing it to audiophiles for a fraction the amount one would otherwise have to pay to achieve this level of quality! A brief update that I do believe the 24-chips are doing a better job than the 12-chips, especially in terms of imaging/soundstage; good recordings sound AWESOME; much better than I ever expected! In listening to my collection, there’s still something to be desired. Some of which I was attributing to poor recordings got much better with DDDAC, but the 24-chips did not seem to help out too much more here. Anyway, I have to wonder how much more I might be able squeeze out of these poorer recordings, especially in terms of better vocals, but this is another issue that certainly goes beyond all DACs of today. The tonal balance seemed to shift a little toward the lows with the 24-chips and I’m about to experiment with .47uF Sonicap Teflon output capacitors to see how the tonal balance compares to the current Multicap 1uF RTXs that I have installed. It’s always a tradeoff for me here, with jazz seeming to benefit from enhanced highs but other music, like that containing complex vocals, benefiting from slightly relaxed highs. hier sitze - mit Tränen in den Augen vor Glück. Also wahrhaft richtig toll. Also Dein Teil hat so gefehlt, wie das letzte Mosaik im Gesamtbild. gegenwärtig eigentlich kaum mehr eine Verbesserung vorstellen kann. Ja. Ja. P.S. Ich spare schon für die restlichen 36er DACs. Hello Doede, hope you are well. I have managed to get some sleep this week finally, although no thanks to your wonderful DAC ;-). I have spent the last two nights solidly listening to it and having no time for anything else. You know when you have got yourself a great new piece of hi-fi equipment when you find you can re-discover your entire music collection and hear things you never heard before. I'm amazed that even though the first part of the DAC sounded excellent and I was beginning to have my doubts about how much better the next stage would be, those doubts have been well and truly quashed and now I see where the shortcomings of the built in DAC were. The music now seems to breath. There is so much more richness to voices. It's very natural and flows along beautifully. It also has, what I call the "LP12 groove". I owned a Linn LP12 many years ago and I found that the timing of that deck and its ability to get your feet tapping was far beyond any other piece of hi-fi equipment I ever owned. But this DAC has that quality and I find that truly amazing. It really does say to you, "Forget the sound, just listen to the music", and that's what I've been doing for the last couple of nights. I do have one slight concern though. When I put the board together, I followed the component names on the board. I had the circuit diagram there for reference but I have to admit that I was not taking too much notice of it as the board was very clearly laid out. Which means that I had a few components spare at the end namely the output caps and 100K resistors... Which for the last 2 nights have not been used at all. Would I be right in saying that is why the output is a lot lower than it was with the built in DAC? The only problem I have at the moment is that I am still using naked circuit boards and the interconnects to the amp are soldered directly to the output from the board. I am hoping to source a case to put it all into this weekend where I will be able to mount the output caps and resistors, but my question is... Is it safe in the meantime and what am I losing out on without those components in place? Once again I cannot thank you enough. I am looking forward to a very relaxing weekend of non-stop music. I also have my friends asking about it, so don't be surprised if there are more orders for DACs from me (as I will inevitably have to build them) in the near future ;-). Well, yesterday I built the DAC and paired it with one of the T-amps. I configured XP for USB output. And...it blows my mind! Beyond excellent! Incredible! And I didn't calibrate voltages or anything yet! But after a minute it overheated and stopped. I built the chip tower without the two side heatsinks. Surprising how hot it becomes! But today I will finish it properly and look for some Mundorf capacitors too. So, thanks for your great design! I feel like my system now sounds as good as anything I have heard in the $10,000 stereo store in San Francisco. (Except for their $100,000 reference system, but I believe the price may be too high.) Probably next month I will add a slave module, just for the fun of it. Hey, just wanted to say some more about the DAC, now that I have run it for a few days. 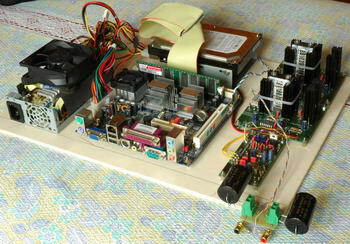 Initially I used a junk PC power supply for it and my T-amp. Now I have a battery. I got a UPS on ebay for $20, so that's a 12V 7AH battery and charge system for cheap. The sound quality is better. The PC supply had some noise from the fan or something, but of course the battery is perfect. I'm not sure it needs any input capacitors. When I checked calibration voltages on the board, they were all in the middle of the range already. Is there a precise value that they should be? Would things sound better if I calibrated more exactly? Configuration of XP and Foobar for the USB is interesting. I set the driver to "use audio features" and "map through this device." It doesn't seem to work without "use audio features," and I use "map" because I like to hear PC audio too... I don't think XP changes the data between Foobar and the DAC, so music quality is not affected...or? In general, I'm just 100% happy with the sound, and your design is classic. Use cheap parts to produce better signal quality than one expensive part, what a good idea! The DA works absolutely great !!!!! J I had to make several tests with my « standard » capacitors at the output stage. Finally I am at a nice level, much better than the analogue out of my DVD. installed the Mundorf silver-oil caps on Monday. Amazing change! The sound moved back some meters through my wall! How did you determine the .47uF value? This is my first (and only) outboard DAC. But I found a StereoLink 1200 for $20 and compared it. With the normal caps, the two DACs sounded similar (of course, I'm using Anthony Gallo Nucleus Micro sat/sub speakers, not too bad but probably not capable of revealing small important differences) but of course the Mundorfs made it obvious...and when I build new full-range speakers, I am sure I will hear even more. PC USB audio must become the standard method. No transport errors, instant queue and seek, USB noise insulation...why use CD players at all? I will play only .ape format now, and use a wifi PDA to control the server in another room...only speakers and small DAC/amp in the listening room. Thanks for the great Mundorf tip. I should probably order more kits to build for friends, when they hear my little system!